In Provence, set between the Luberon hills and the beautiful Monts de Vaucluse, lies the village of Roussillon, sparkling with ochre colour under the deep blue sky. Roussillon is ranked as one of the most beautiful villages of France, and is totally unique. 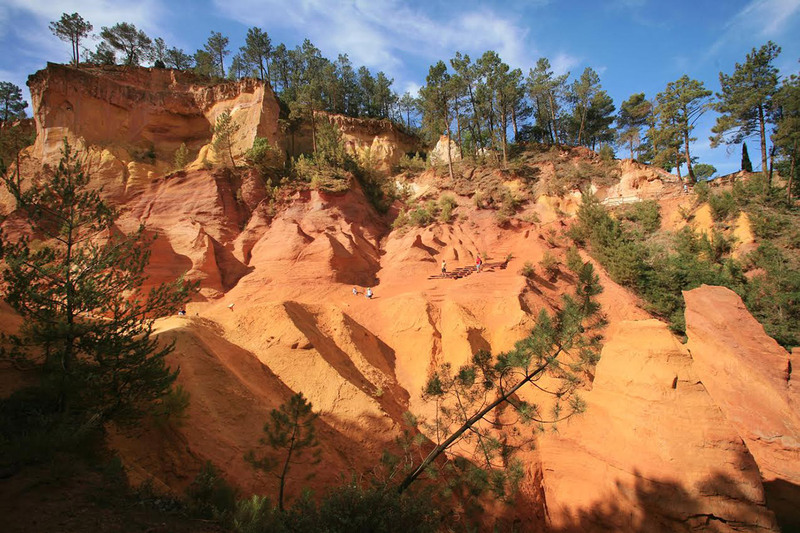 Roussillon is located in the very heart of the biggest ochre deposits in the world, and is distinguished by a wide palette of flamboyant colours. 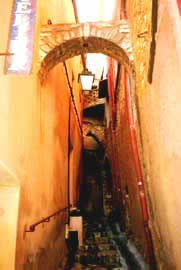 Wandering the narrow streets, stairs and squares in Roussillon opens your eyes to the beautiful natural pigments used throughout the village, and the millennium-old knowledge of how to use this generous natural gift. 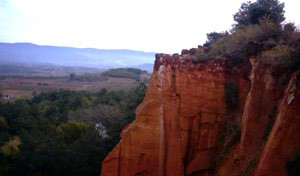 In Roussillon, man has long worked in harmony with nature. Ochre is everywhere : streaking the hills in the unforgettable countryside and on the walls of the houses which have been washed with the traditional ochre rendering. Ochre is also in the hearts of the people, for whom ochre was the source of work until the middle of the 20th century. 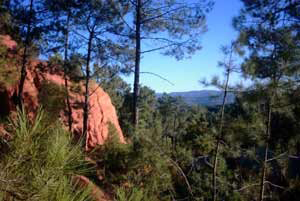 Discover the presence of the ochre sands by following the Ochre Trail – the "Sentier des Ocres" – a path through the ochre lands which has been laid out and marked. The trail takes you amidst the earth pillars and hills carved out by water, wind and the hand of man. 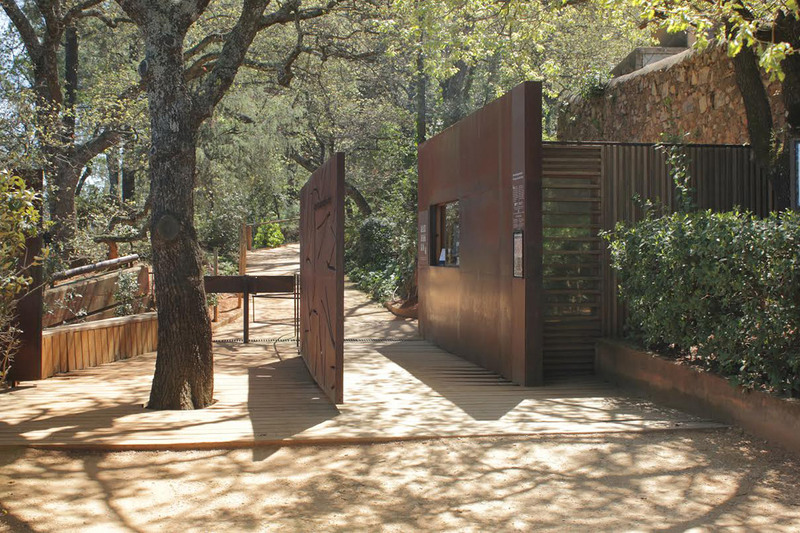 In Roussillon you can also learn about the industrial history of ochre in the area by visiting the Ochre and Colour Conservatory “Conservatoire des ocres et de la couleur” in the former Mathieu factory on the D 104 road, on the way to Apt. This former ochre plant offers tours, classes and information on the use of ochre. Ochre has been used since prehistoric times, and was mined by the Romans during the era of the Roman settlement of Provence. However, ochre only became a widespread, industrial product in the late 18th century when Roussillon native son Jean-Etienne Astier put forward the idea of washing the ochre-laden sands to extract the pure pigment. Today, though natural ochre faces strong competition from synthetic pigments, it remains unrivalled for use in certain applications. 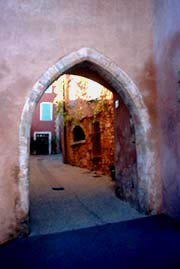 Roussillon is not a historical site, though it is an old and venerable village. It is not the site of important historical events, though its architecture reflects the memories of centuries past. It is above all a magical place, where the many different oxides in the ochre sands combine in countless shades. The colours shine through, in the surrounding countryside, in the washes on the old homes, in a trompe l'œil painting on a gate, on a wall. 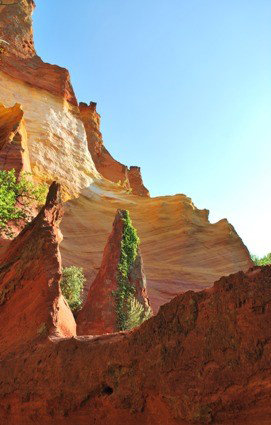 Roussillon offers countless details to the observant eye, and is well worth an unhurried, leisurely visit. Place du Pasquier : first a grazing land, then the site of seven annual fairs. It became the schoolyard, then the pharmacy, prior to serving as a car park and as access to the Social and Cultural Centre. Place de l'Abbé-Avon : also called the "back of the oven", for the baker’s oven was located in the hollowed-out rock here. 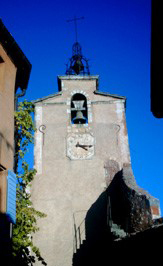 This small square is named after the Abbot who cared for the people of Roussillon during the plague of 1720. To the left, see the street named “Porte Heureuse”. Place Pignotte :named after the alms which were distributed to the poor here. The alms were little loaves of bread in the shape of a pine cone, and were known as "pinhotte". The practice of distributing these alms was instigated by Pope John XXII in 1316. Place de la Forge : this may have been the courtyard of the former castle, built in 987. A small crucifixion scene and a few ruins of the castle remain. Orientation table : the highest point in Roussillon, with a sweeping view from the Luberon to the Monts de Vaucluse. Saint Michael Church : the church, whose origins of the church go back to the 11th century, originally faced the castle, inside the fortified walls. The church underwent countless renovations over time, necessitated in part by its location by the cliff. Note the 17th century façade, the 18th century choir, and late 18th-century works by Potevin, including the baptismal fonts, statue of Saint Michael, and Christ on the Cross. Place de la Mairie : This Town Hall square, the lively centre of town, is lined with lovely 18th-century homes. Place de la Poste : home to an old fountain where livestock were watered. 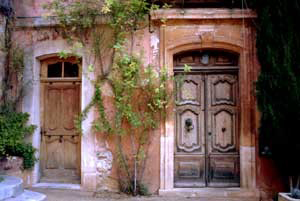 The ochre-washed streets in Roussillon are home to many art galleries, sparkling with works by talented artists which draw the eye of art lovers, collectors and passers-by as they visit the village. 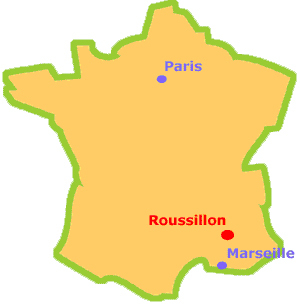 The village of Roussillon en Provence currently has fifteen different venues for seeing art, representing over fifty artists. 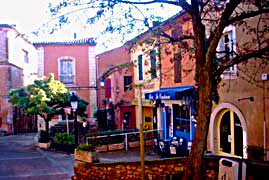 Roussillon, the village of ochres, is also the village of art, renowned throughout the Luberon. 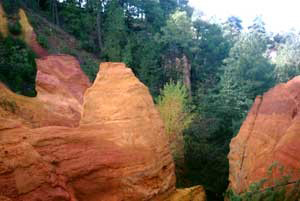 Ochre is a natural pigment that is in the sandy soil which makes up the cliffs around Roussillon. Iron oxides colour the sands with shades ranging from yellow to violet. The mineral landscape reflects the effects of erosion and mining work done by man. 230 million years ago, Provence lay under the seas, and remained underwater for a long, long period. Several thousand meters of sediments washed away from the surrounding land masses and slowly built up on the sea floor. 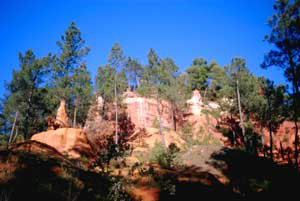 This sediment later formed the white limestone so characteristic of this region – Mont Ventoux, the Luberon range, Sainte Victoire, Verdon canyon, the calanques etc. Then, approximately 110 million years ago, the sea grew deeper. Grey clay formed a new sediment which deposited on top of the limestone, creating a formation which geologists later called the “Aptian stratotype” . Little by little the sea filled in. The water became very shallow and turbulent, and green sand containing small mineral grains known as glauconite settled on top of the grey clay. Then, approximately 100 million years ago, major upheavals took place in the land masses around what is now Provence. After the long period of marine life, the earth shifted and the area that is now Provence found itself totally out of the water. The climate was tropical at the time. Strong and steady rainfall leached the green sands from the newly emerged land mass. The rain slowly transformed the green sand into ochre sands, then into white sand in several long steps. First the groundwater produced by the heavy rains dissolved all the elements in the green sand except for the sand itself, which was highly resistant. The minerals in this solution, such as kaolinite and goethite, crystallised and filled the empty spaces between the grains of sand, creating the ochre sands. The iron hydroxide concentrated on the surface, forming a hard, impervious layer similar to laterite. The red, yellow and orange colours in the ochre sands continue to be somewhat of a mystery. We know that goethite is involved, but what mechanisms has nature applied to create such a profusion of shades ? Our work continues ! 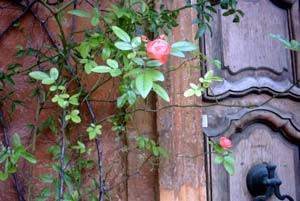 Lady Sermonde and Lord Raymond d'Avignon lived in the castle in Roussillon. Guillaume de Cabestan, son of the Lord of Cabestan in the Hautes Alpes was taken on at Roussillon castle to work as a page and to apprentice to a knight in order to learn knightly ways. Raymond d'Avignon, who was an avid hunter, preferred the company of his horses and huntsmen, and often left his wife alone. And with time, Dame Sermonde and Guillaume fell in love. The young page’s songs became more insistent and obvious, and the domestics at the castle reported their suspicions to Lord Raymond d'Avignon. Wanting to know more about the situation, Lord Raymond invited young Guillaume on a hunting party, and turned the conversation to his wife. So as not to betray Dame Sermonde, Guillaume told Lord Raymond that indeed he was in love, but with Dame Sermonde’s sister, Agnès. To be sure, Raymond d'Avignon decided to travel to the nearby town of Tarascon, with Guillaume, in order to have confirmation of Guillaume’s story. Agnès quickly understood all that was at stake, and to save the two lovers, she played along. Dame Sermonde learned of her husband’s actions, and was both furious with his behaviour and indignant that her love for Guillaume went unacknowledged. She demanded that Guillaume tell their story in one of his songs. Guillaume sang of their love and, hearing the truth, Raymond d'Avignon flew into a rage and took his revenge. During a hunting party, he stabbed Guillaume in the back, cut off his head, and cut out his heart. He returned to the castle with the heart and had his cook prepare it with a spicy sauce. Dame Sermonde delighted in the dish, until her husband informed her that she had just partaken in dining on the heart of her lover. "Seigneur”, she said, “you have given me such a good meal, that I never want to taste anything else again”. Realising that his wife was escaping his control, Raymond d'Avignon drew his sword, but Dame Sermonde fled out of the castle to the edge of the cliff, and threw herself over the top. It is said that her blood coloured the lands all around, and that a spring gushed forth at the point where her fall ended. 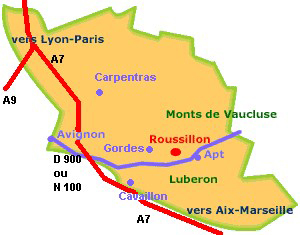 In between Luberon and Monts de Vaucluse, the village is off the road Avignon-Apt.